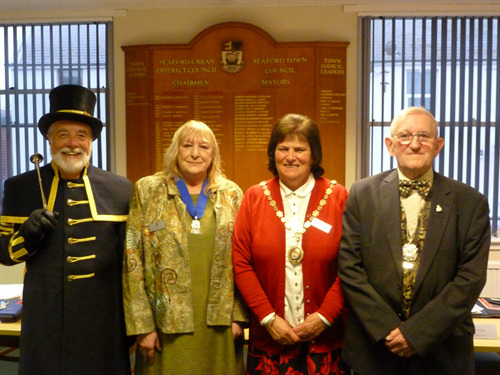 The Council held its Annual Meeting on Thursday 10th May and is pleased to announce that Councillor Linda Wallraven has been elected as Mayor of Seaford for the coming Municipal Year. This is Linda's 2nd consecutive year and 4th year overall as Mayor. Having served as Mayor for two years in 2011 to 2013 and 2017 to 2018 Councillor Wallraven is thrilled to be back in office, supported by her close friend and consort, Liz Holland. Councillor Wallraven is the Council’s longest serving Councillor, being in her tenth year in office. Councillor Wallraven also took on the additional duty of District Councillor for Lewes District Council in 2015. Immediately following the election of Mayor, the Council voted Councillor Lindsay Freeman to the position of Deputy Mayor of Seaford. Councillor Freeman served as Mayor of Seaford from 2016-2017, putting her in good stead to support Councillor Wallraven as Mayor. 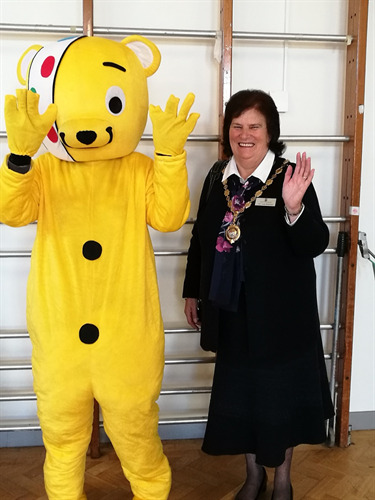 Councillor Wallraven has announced her chosen charities to raise funds for during her time in the Mayoral Office as Teddy Treats Children's Charity and Seaford Museum & Heritage Society. Teddy Treats - In 2013 the Seaford community got together to help fund raise for a local child who needed support. The town showed huge kindness and togetherness, giving time and energy, with passion to help raise money. The family were totally overwhelmed and as one of the people who helped with some of the activities I witnessed how a local community came together to help in any way they could. Some donated gifts, others time, sharing their skills, we all came together. Seaford people joined in walks over the South Downs, children raised money at discos, as well as a special fundraising ball, supported by local businesses. When a community get together magnificent things happen. 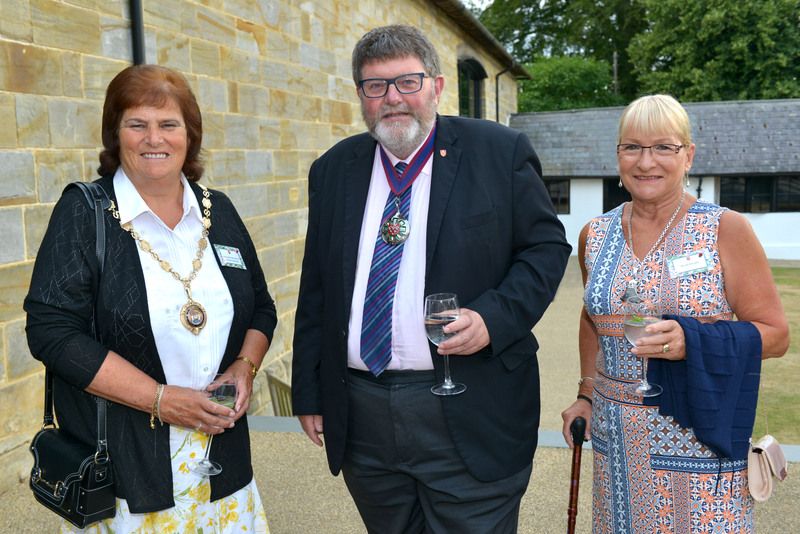 Seaford Museum & Heritage Society - Here's what Chairman Kay Turvey had to say when she found out that they were one of Councillor Wallraven's chosen charities "The Museum Trustees and I were delighted and honoured to be chosen as one of the beneficiaries of the Mayor’s Open Garden Trail 2018. Although we have been fortunate in receiving grants from the Keith Baker Trust and the Heritage Lottery fund to provide access for those with mobility problems, the concomitant costs of moving and replacing/rebuilding half our displays and refitting our entrance floor have been high. Without our team of hardworking volunteers doing as much work as possible in-house they would have been prohibitive. We have also lost 6 months income from visitors so this money will help us to continue to improve our displays, particularly signage and interpretation panels to add to the visitors’ enjoyment". Kay Turvey, Chairman. How quickly my Mayoral Year is passing by, I have been to some memorable events and it’s the young people who achieve so much. Recently I attended 'The Young Musicians Awards' and ‘The Young Writers Awards' both organised by The Rotary Club, the ability was outstanding and the judges had a very hard job and it was an honour to hand out the awards to the youngsters. I unveiled a Blue Plaque at Seaford Railway Station in recognition of the West Indian Regiment which was formed in 1915 here in Seaford. A number of the young men died here with influenza and are buried amongst the Commonwealth War Graves at Seaford Cemetery. The conditions in the camps were not good. One of the huts made its home in Bishopstone Village and can be seen today, they were made of corrugated metal and were lined with asbestos! No Health and Safety back then. We welcome people with links to W.I. 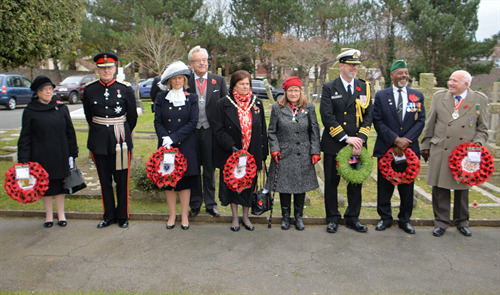 from London every year for a Service of Remembrance at The Cemetery together with the Canadians and Irish which falls on the Tuesday after Remembrance Sunday. On a lighter note I was invited to The Book Show at The Crypt Gallery and was asked to come as a book character, so I went as a pirate as I had all the gear. It was a very good event for young children and the organisers are hoping to repeat the event next year. I've been attending School Assemblies to promote the election of the new Deputy Young Mayor with Tom Exley our Young Mayor who did a good presentation. I joined Tom on his last fundraising coach trip to Hampton Court and what a fabulous day we all had. Unfortunately, we had to make the decision of cancelling my Quiz Night due to the bad weather but safety had to come first. It has been rescheduled for Tuesday 17th April at The View, 7pm. On Thursday 5th April I have a fashion show organized by M. & Co. at 7pm; there is usually a discount for clothing on the night, hope you can come along and support it. Saturday 21st April at 2pm I have organised a guided tour of St. Andrew's Church and Churchyard followed by a Cream Tea in Bishopstone Parish Hall. St. Andrew's Church is one of the oldest churches in the county dating back to Saxon times. Each year at its Annual Meeting the Council must elect a Mayor as first point of bsuiness; the Mayor then serves in office for the Municipal Year (May to May). The Council is lucky to have had such a variety of Mayor's since its formation in 1999, each with their own aspirations for their time in office and with unswerving dedication to their roles. Often, as the Mayor, they would receive an invite to an engagement on a weekly basis, some weeks as special occasions there may even be three or four engagements - this is on top of their duties and responsiblities as a Councillor, and all carried out voluntarily.